Time again for Guild Checkpoint, as we look at the guilds within the Old Republic community. I’m sure there are a few chuckling at the name of this week’s guild, Knights Who Say Ni, and probably just as many a bit puzzled. Being an “old man” I understand the joke from a Monty Python movie, Monty Python’s Quest for the Holy Grail. A different sort of comedy, but funny none the less…back to the subject at hand. Let’s get ready to take a closer look at this Republic guild from the UK. When and how did KWSNi get its start? The Knights Who Say Ni was formed well over 10years ago, though this “formation” of KWSNi, I like to say was founded in the first days of “The Lord of the Rings Online” (so 4/5 years ago.) Since then the guild has grown exponentially from that small group of friends originally to 50+ members, spanning across a great deal of games. Does the guild only play MMOs? If not what other games does KWSNi play? No not at all, we’re a “gaming” community. Which means as long as the game is good, we’re likely to have somebody on the forums who have played or are currently playing through it. The more community driven games (such as MMO’s) are where you’ll tend to find large numbers of our group banding together in-game. We’ve dabbled in almost every MMO and SW:TOR is the next big one on the horizon that we mean to conquer. Another big game coming out this year that we hope to have a good presence in is Battlefield 3- a Online FPS. So we’re not “just” MMO’s. I’m a huge Monty Python fan, so I can answer this, but can you elaborate where you got the idea for the guild name and why did you choose to name your guild this? 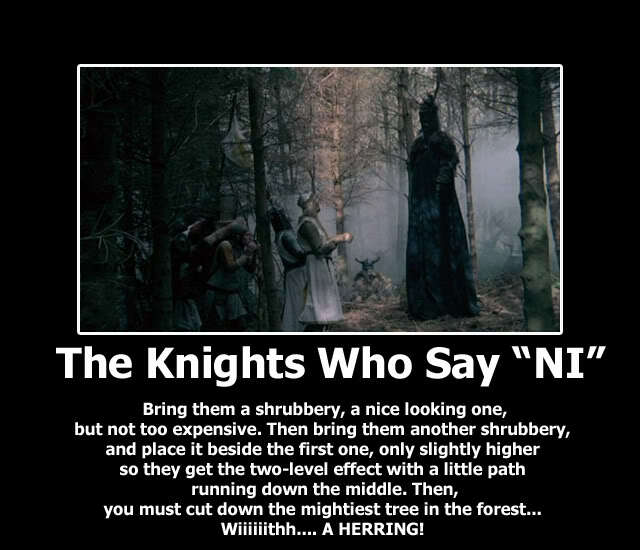 As most people can guess, The Knights Who Say Ni is a reference to Monty Python. It is where the name originated and it has served us well, in attracting members with a similar attitude and sense of humour… Now, go fetch me a SHRUBBERY! What kind of server and why? The core playerbase, which is coming in and playing SW:TOR, are coming from Lord of the Rings Online- which unfortunately only has PvE servers. A large portion of our guild enjoy playing the PvMP on LOTRO and have experienced Warhammer PvP (as well as other MMO PvP styles) and upon deciding to venture forth into SW:TOR we put a vote up on our forums and it was decided that we’d let loose on a PvP server. If you all are going PVP server, has the KWSNi thought about the newly announced RP-PVP servers that will be in the game? It’s something that we could possibly give some thought. But it’s nothing we’ve discussed recently. Guild Phase 2 is out now, how has KWSNi made use of this alignment time? You are a Republic guild correct? Does the KWSNi plan on being a part of the Empire also? What is the biggest thing KWSNi guild is looking forward to in SWTOR? [22:19:33] damieyen flamingstar: fun friendship and a dead sannas!!! What is one thing KWSNi is hoping will be in at launch or will get added to the game soon? I’m a big proponent of datamining and using the SWTOR information to better our website and forums, so it’s easier for our members to use. But I’d say a big feature allot of members would like Guild Spaceship/Housing and some more options with the Space Combat! Are you personally excited about playing SWTOR? What class do you plan on playing first and why? If someone is looking to join a European PVP and thinks the KWSNi might be for them, how do they go about joining? The simplest way is obviously just heading to the SWTOR.com Official site and applying to KWSNi through the guild HQ (http://www.swtor.com/guilds/4335/knights-who-say-ni). If you’re not signed up at SWTOR.com (god heavens why not?!) head to www.kwsni.com and introduce yourselves on the forum. You’ll get a warm-ish welcome and probably set some tasks, I mean no one’s actually managed to cut down that tree with a herring yet. Could YOU do it?! I want to thank Jono for all his time and hard work to getting this information to me. He had a lot of RL issues computer problems and planning for some big events in his life. If you are looking for a European PVP Republic guild I would definitely check this guild out! Remember, if you would like to have your guild to be highlighted on CRR, please submit your guild’s name and website in an email to me at jason@corellianrun.com. 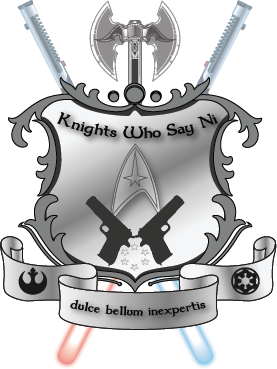 the knights who say niiiiii what can you say about them………..
they are friendly and kind folks with good humor and always willing to help nm what game since i joined them its been…….CRAZY. Nu! Great article and thanks to Jason for giving Jono the opportunity to discuss our Guild, and also thanks to Jono for taking the time to do it (he loves all the attention really). I Joined KWSNi in LoTRO after taking a break, came back and got a message from an old member who had joined them …… the rest, as they say, is history. @Loxion Thanks for the compliment. Jono was great to not only introduce me to the guild, but despite all the issues he had going on in RL, he managed to help get all the info.